A long time ago (in 1978) in a galaxy called ABC some television executive came up with the bright idea to put together and air The Star Wars Holiday Special . And our galaxy has never been the same since. In the storyline that ties the special together, Chewbacca and Han Solo visit Kashyyyk, Chewbacca’s home world, to celebrate Life Day. They are pursued by agents of the Galactic Empire, who are searching for members of the Rebel Alliance on the planet. The special introduces three members of Chewbacca’s family: his father Itchy, his wife Malla and his son Lumpy, though these names were later explained to have been nicknames, their full names being Attichitcuk, Mallatobuck and Lumpawarrump, respectively. During the special, scenes also take place in outer space and in spacecraft including the Millennium Falcon and an Imperial Star Destroyer. The variety-show segments and cartoon introduce a few other locales, such as a cantina on the desert planet of Tatooine and a gooey, reddish ocean planet known as Panna. Featuring: Bea Arthus, Harvey Korma, Diannah Carrol., Art Carney and Jefferson Starship! The program also features many other Star Wars characters, including Luke Skywalker, C-3PO, R2-D2, Darth Vader and Princess Leia (who sings the film’s “theme song”, set to the music of John Williams’ Star Wars theme, near the end). The program includes stock footage from Star Wars, and also features a cartoon produced by Toronto-based Nelvana that officially introduces the bounty hunter Boba Fett. The special is notorious for its extremely bad reviews. Anthony Daniels, in a documentary promoting the worldwide tour of Star Wars: In Concert, notes with a laugh that the Star Wars universe includes “The horrible Holiday Special that nobody talks about”. Nathan Rabin of the AV Club wrote, “I’m not convinced the special wasn’t ultimately written and directed by a sentient bag of cocaine. 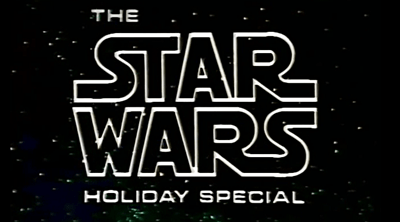 The Star Wars Holiday Special has never been rebroadcast or officially released on home video and has become something of a cultural legend, due to the “underground” quality of its existence. May the force be with you with this one.